Apollo 11 astronauts Buzz Aldrin and Neil Armstrong made history on July 20, 1969 as the first humans to walk on the moon. 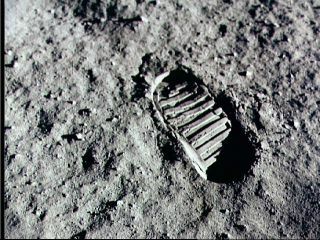 Seen here, a closeup of a boot print left behind by one of the astronauts. Most of the mission was behind them, but the Apollo 11 crew still faced the challenge of getting back to Earth. Neil Armstrong (commander), Michael Collins (command module pilot) and Buzz Aldrin (lunar module pilot) had one last full day in space before a planned splashdown in the Pacific Ocean the next day. The Apollo 11 crew spent mostly a quiet day resting up and making preparations for the landing, but they did do a live television broadcast that evening where they reflected upon their journey # the first moon landing in the eyes of the many who watched. "A hundred years ago, Jules Verne wrote a book about a voyage to the moon," said commander Neil Armstrong in the broadcast, referring to the book From the Earth to the Moon. "His spaceship, Columbia took off from Florida and landed in the Pacific Ocean after completing a trip to the moon. It seems appropriate to us to share with you some of the reflections of the crew as the modern-day Columbia completes its rendezvous with the planet Earth in the same Pacific Ocean tomorrow." Added Collins: "It may have looked to you simple or easy. I would like to assure you that has not been the case." He enumerated several examples, but began with the rocket that brought them into space in the first place. "The Saturn V rocket, which put us into orbit, is an incredibly complicated piece of machinery, every piece of which worked flawlessly."